With negative air systems, warm air is sucked out with exhaust fans - air intake is through shutters. Sizing of equipment will depend upon the greenhouse dimensions, the season of the year, the crop and the transpiration rate of the crop. Passive systems use roof vents and wall openings; air flow through a vent can either be up (warm air rising) or down (cold air dropping). Conditions at any given moment will determine the direction. Outside wind and interior air circulation (typically horizontal air flow, HAF) will influence the performance of both negative air and passive systems. The two systems can be used in the same greenhouse - but not at the same time. 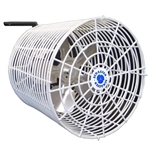 Negative systems require restricted air intake openings to achieve air flow speed. 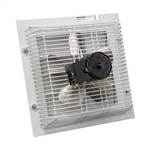 Because of this, open vents or sidewalls make exhaust fans almost completely ineffective. 24 hour timer unit for roll up shade systems (Call for a quote) used to adjust the photo-period. Allows for several openings and closings in a 24 hour period - the benefit is that the curtain can be automatically raised after the sun sets. CSA pre-approval (VEC-CSA) is available as an option.